Nowadays, when we no longer have the Bais Hamikdosh, we are, nonetheless, required to reach a level of purity in order to fulfil the requirements of the Torah. How do we do this? One of the ways that we attempt to reach the required levels is to read the Parsha of the Parah Adumah in our shuls in preparation for the month of Nissan. We proceed with the Tefillah that, this year, HaKodosh Boruch Hu will grant us the Geulah and allow us to return to Yerusholayim, be cleansed by the Parah Adumah, and merit to bring the Korban Pesach. This reading and expression of our desire to purify ourselves, in and of itself, has a power of purification – un’shalma porim s’foseinu. There is a second manner in which Jews have been able to further purify themselves, and that is to immerse in a Mikva. This purification, which accompanies the purification of the Parah Adumah, actually precedes it. Indeed, it has been continuously performed since the time of Avrohom Avinu. The purifying waters of the Mikva have the ability to raise our level of taharah and allow us to more properly serve HaKodosh Boruch Hu. 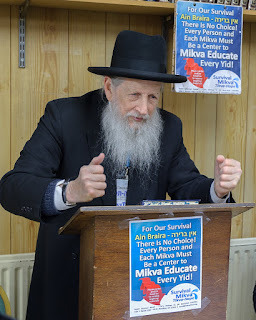 The idea of promulgating the education about the purity that is attained through Mikva is one that has become the life work of Rabbi Emanuel Ravad. He tried other tactics in other communities to try to inspire Jews of all backgrounds. At one point, he concluded that the mitzvah that is most central and has the power of causing major change in those who have been alienated from Yiddishkeit is Mikva. He played on the fact that the word Mikva is the same as the word for hope, tikvah, and the return to spirituality can come through the purification of the Mikva. It is counter-intuitive, but many people involved in Kiruv have told me that, often, the first mitzvah that budding ba’alei teshuva accept is taharas hamishpachah. Although it is certainly a very difficult mitzvah for newcomers to take upon themselves, it has the advantage of being private. When my daughter lived in Indianapolis, she was asked by the leaders of the non‑Orthodox temple to lead a group of women in the study of taharas hamishpachah. Many of the women, who were not yet Shomrei Shabbos, accepted this mitzvah upon themselves. When Rabbi Ravad made that decision, there was no stopping him. Although he returned with his family to his native home in Bnei Brak, he travelled to conventions of Jewish educators and meetings of Federations to spread the idea of purity through the Mikvah. He distributed thousands of copies of Rabbi Aryeh Kaplan’s book, “Waters of Eden” at no charge. When he couldn’t afford a hotel room, he just stayed in the lobby of the hotel. In order to raise funds, he travelled the length and breadth of the country and even collected dollar bills in shuls. 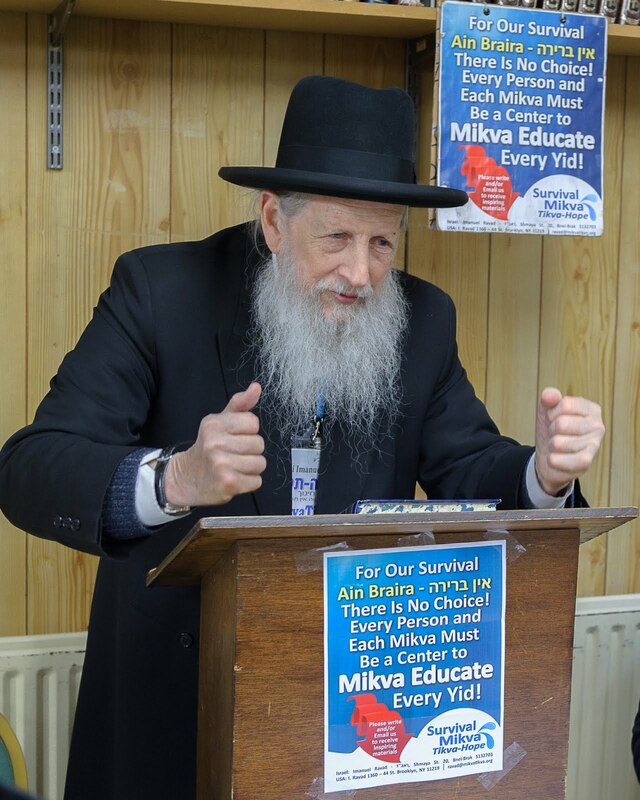 His wife stayed in Eretz Yisroel and supported the family while Rabbi Ravad spent months on end in a basement apartment in Boro Park raising the money to spread the word of Mikva education. Many people confided in Rabbi Ravad about the fact that his information had changed their lives. Although, by their nature, most of the successes of Rabbi Ravad’s work will forever be known only by the people who have been affected, there is no question that the educational efforts had a significant effect. At some point, Rabbi Ravad realized that because of the sensitive nature of Mikva education, it was important to promote the education of the Mikva for its other uses. Although it does not carry the same importance in Halachah, the familiarity with the Mikva through its other uses of purification is often the avenue through which the uninitiated learn about Mikva. HaKodosh Boruch Hu gave us 613 Mitzvos. Some can be performed by everybody, but others can only be performed by some. Nobody can accomplish all of them. Some Mitzvos are only for Kohanim, while others cannot be performed by Kohanim. Some are only for the king, while others are for special circumstances that not everyone experiences in their lifetime. The author can be reached at rabbisbloom@gmail.com"